'The Square' Is Edgy Swedish writer-director Ruben Östlund ruthlessly roasts the art community in this loose, leisurely paced series of deadpan vignettes. 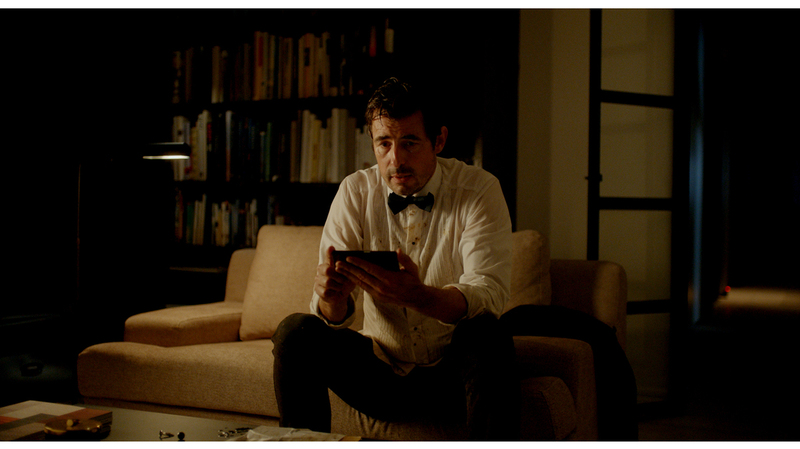 Distressed Swede: In the mordantly satirical The Square, Christian (Claes Bang) curates a contemporary art museum in Sweden. Life does not imitate art in Swedish writer-director Ruben Östlund's The Square. No, something much worse happens: Life imitates conceptual art. The Square is the first Swedish movie to win the top prize at the Cannes Film Festival since 1992's The Best Intentions. That's ironic, since Östlund's often startling satire is about a man with the best of intentions: a contemporary-art museum director tellingly named Christian (Claes Bang). He's handsome, successful, and, of course, as insensitive and self-centered as the rest of us. Christian's next planned exhibition, titled "The Square," will mark off a four-by-four-meter space as "a sanctuary of trust and caring." As Christian prepares for this conceptual monument to empathy and altruism, trust and caring will drain from his life. The galleries Christian supervises hold massive photographs, carefully spaced piles of gravel and a white-neon sign that announces "You Are Nothing." But the future is conceptual and performance art. The museum director is so sure of this that he subjects his wealthiest donors to an assault during a black-tie fundraising dinner. A performance artist (Planet of the Apes motion-capture performer Terry Notary) enters the ballroom in simian mode and displays dominance behavior in an increasingly threatening manner, while his human prey struggle to understand how to respond. It's a surreal confrontation Luis Bunuel would have appreciated. The monkey business ties to one of the script's less successful threads: Christian's one-night stand with an American reporter (Elisabeth Moss) who lives with a never-explained bonobo. Their sexual encounter is a sort of performance that ends with a tiff over one of the props. But the film's central theater piece is a street skit in which Christian is enlisted to help protect a young woman from an attacker. This Oscar-worthy improv turns out to have a classic motivation: When it's over, Christian discovered he's been pickpocketed. In a misguided attempt to retrieve his wallet and phone, Christian paints as thieves all the residents of a lower-income apartment building — and makes an implacable enemy. He's also so distracted by the personal turmoil that he neglects to supervise the PR agency that's about to post on YouTube a fatuously controversial video to publicize "The Square." Multilingual and meandering, The Square is a difficult film that probably won't attract much of an audience in the U.S.. That's partly due to the edginess of its ideas and sensations, but also because of the way they're presented. The movie is an overlong series of loosely connected, leisurely paced vignettes that don't all pay off. Also, Östlund's wit is sometimes just a little too deadpan. For example: The movie barely announces that it's set in an alternate universe. Christian lives among such recognizable consumer-culture phenomena as 7-11s, Teslas, foodie-ism, and electronic dance music. Yet in his Sweden, the monarchy has been abolished, and the former royal residence has been repurposed. In fact, Christian presides over a wing of the building, whose sign identifies it as the X-Royal Museum. Such mordant touches may not register immediately, but they have a cumulative impact. The argument in favor of The Square is not that it's great fun to watch, but that it's very entertaining to ponder after viewing. It lingers, both amusingly and disturbingly. That's more than you can say for most conceptual art.